Healthy thyroid function is an important aspect of curbing hair loss that Thyroid Boost effectively addresses. For pricing, and further information, click here. Organic Sea Buckthorn Seed Oil softgels contain a rare fatty acid known as palmitoleic acid (Omega 7), which is reportedly good for the skin. Alongside Omega 7, other essential fatty acids such as linolenic acid (Omega 3) and linoleic acid (Omega 6) also are found to exist within organic Sea Buckthorn Seed Oil in an almost perfect 1:1 ratio. Organic Sea Buckthorn Seed Oil is rich in Vitamins E, A, B, and P, flavonoids, phytosterols, amino acids, serotonin, and 28 trace elements, including: iron, zinc, calcium, magnesium and selenium. As a result, organic Sea Buckthorn Seed Oil is high in antioxidants, great for white blood cell development, is widely used in immune support, and is incredibly healthy for skin, heart, cholesterol, digestive, and liver health. General lack of minerals and nutrients in the foods found in the "Western Diet" necessitates supplementation, and organic Sea Buckthorn Seed Oil is a fantastic source for these missing nutrients. By providing the body what it needs, not only does it encourage healthy hair growth, but a stronger immune system, anti-aging qualities, and healthier organ function. CS, do you know how much iodine and selenium there is per capsule? P.S. Nice looking bottles for the Ortho Nutrition line. CF - The exact amount I am not certain since it is classified as a food source of organic iodine, selenium, alginates, and fucoidan and many others. Mainly the amount will vary. However, best estimates it will contain approximately half of 2 drops of 5% Lugol's (which is approximately 6 mg in a standard dose, not per capsule). Since there is a heavy metal relationship with inflammation, calcification. This product acts as a heavy metal detox along with supplying various minerals including iodine and selenium, so more of an all in one. Cs, So do I still need to take selenium and iodine if Im taking thyroid boost? boogv510 wrote: Cs, So do I still need to take selenium and iodine if Im taking thyroid boost? No, it has all of the co-factors. - The type of iodine found in Thyroid Boost is elementary iodine - a form that our body expects and utilizes via thyroid/pituitary gland communication. As a result, the quantity of iodine is not important due to the form that it is in. The thyroid will absorb as much as it needs and the rest will be converted into iodide (oxidized form of iodine). 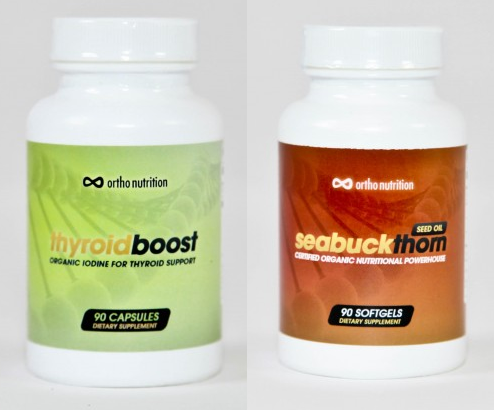 - Thyroid Boost is a raw and organic whole food; NOT a formula. We have a CoA with a micro-biological and toxic profile on every new batch, but it does not pertain to a "list" of ingredients or "active ingredients" that is usually found in supplements or vitamins. What you are consuming is a living form of a very unique specimen of seaweed that is essentially in a suspended state until it reaches liquid (via the gut or simply popping a capsule open and dumping it into liquid). - He stated that "Still, some nutritional values have been detected via testing for the knowledge of the potency (for example, the "Vitamin B" group of nutrients), which are hardly ever found above trace levels in any foods - we have it in the detection values. This is a huge boon for a non-formulated supplement. However, he *DID* provide some very detailed documents on values such as selenium, however, he requested that it only be shared privately with customers as opposed to publicly for proprietary reasons. So, what I will do, is this... if you contact us at: info@hairevo.com, I will summarize the documents that were given and provide specific values. Good catch. We both did some research and you're right. The Seed oil, overall, has more health value of the two, however... it looks like it lacks anywhere near a therapeutic amount of Omega-7. We'll carry the Berry Oil in the near future as well then, and couple them together in a package. From accounts that I've read online, ingesting both together has done wonders for people. Unfortunately, I have 0 control over something that specific... we have to buy the softgels as is. Companies that due their own liquid softgel blends are typically multi-million dollar operations as you need to do a MASSIVE volume for any manufacturer to consider doing such a thing. Even so, it may not necessarily be a good idea to mix both oils together in one capsule for rancidity purposes... hard to say without doing research. Though, if we do 2 separate bottles it should be all good. I've bought and currently take a few of your supplements. I've been impressed that it includes the cofactors not in other supplements. I was wondering what makes this seabuckthorn supplement different from something we would find elsewhere? Additionally, we will have new package deals with substantial discounts coming up once Antioxidant Boost is back in-stock. Could Thyroid Boost help with hyperthyroidism, or is it recommended just for hypothyroid cases? Quisque wrote: Could Thyroid Boost help with hyperthyroidism, or is it recommended just for hypothyroid cases? CS - do you plan adding some new supplements to your hairevo supplement line? or are there any you would like to add? i would understand if you don't want to share this info though. just being curious. nvmmm wrote: CS - do you plan adding some new supplements to your hairevo supplement line? or are there any you would like to add? i would understand if you don't want to share this info though. just being curious. It's been thought about. However, it might be a while if it happens. Mainly want to test efficacy on some ingredients long before it comes to light. For now I can't say for certain. This study indicates that kombu suppresses thyroid function. What would cause kombu to increase TSH? Shouldn't it lower it? The iodine content would cause TSH to spike. This is not an unexpected result of iodine supplementation. Somewhere on the internet I've seen it speculated that the thyroid is producing more TSH to get the iodine into the thyroid, and when satiated the iodine levels will decrease. I've been supplementing with iodine for a couple of years and it took about 1.5 years for my TSH levels to return to the normal range (around 3), with an initial spike up to 60, which gradually decreased over time. The iodine content would cause TSH to spike. This is not an unexpected result of iodine supplementation. Somewhere on the internet I've seen it postulated that the thyroid is producing more TSH to get the iodine into the thyroid, and when satiated the iodine levels will decrease. I've been supplementing with iodine for a couple of years and it took about 1.5 years for my TSH levels to return to the normal range (around 3), with an initial spike up to 60, which gradually decreased over time. So it took your body a year and a half to adjust to higher iodine intake? That doesn't seem like something beneficial. Did you notice any positives from the iodine supplementation after you had adjusted? baller234 wrote: So it took your body a year and a half to adjust to higher iodine intake? That doesn't seem like something beneficial. Did you notice any positives from the iodine supplementation after you had adjusted? I feel better than before taking supplements, but I wasn't even taking a multivitamin before so I don't know what to credit the improvement to. This is a common question I get about iodine in general. To expand on CF's explanation, here is more info. The medical orthodoxy continues to hold on to outdated myths over iodine at the expense of public health. "From our evidence, it appears that, with all the doses used, the thyroid took up about 6-7 mg of iodine before an equilibrium with the new PII (plasma inorganic iodide) was reached." Regarding the Wolff-Chaikoff Effect, the authors stated: "There is no evidence that the same mechanism is also responsible for the decreased iodide utilization which accompanies small increases in the PII levels." Wolff made no reference to Koutras' paper, although it was published in the Journal of Clinical Endocrinology, not an obscure journal." "Wartofsky, et al  in 1970 evaluated the effect of Lugol solution, administered at five drops (30 mg iodine/iodide) three times a day in five thyrotoxic patients. Following a well-designed protocol, they reported, "It is concluded that the rapid decrease in T4 secretion induced by iodine is not the result of an acute sustained inhibition of T4 synthesis (the Wolff-Chaikoff effect), but rather results from an abrupt decrease in the fractional rate of thyroid T4 release." Therefore, in hyperthyroidism, iodine/iodide in Lugol at a daily dose of 90 mg induced a physiological trend toward normalization of thyroid function, a beneficial effect, not the fictitious W-C effect as proposed by Wolff and Chaikoff. It is amazing that the W-C effect, which is still mentioned in iodophobic publications, has never been confirmed in rats by other investigators and has never been demonstrated in any animal species."
. Wartofsky L, Ransil BJ, and Ingbar SH. "Inhibition by iodine of the release of thyroxine from the thyroid glands of patients with thyrotoxicosis." J Clin Invest, 1970; 49:78-86. CausticSymmetry wrote: This is a common question I get about iodine in general. To expand on CF's explanation, here is more info. That's interesting. So what this study is saying is that iodine only causes a decrease in T4 release in hyperthyroid individuals and it is actually normalizing thyroid hormone levels? What about individuals who are not hyperthyroid? I always suspected that high dose iodine caused decreased thyroid activity due to detox (Mercury and other heavy metals, halogens, etc.). Could this be the case for people who take a long time to normalize on higher doses of iodine? Yes, Iodine helps normalize thyroid hormone (both hypo and hyper). TSH is not very reliable marker alone, and if changes usually temporarily within 6-months of iodine use. T4 is also affected and T3 as well. For hyperthyroidism, iodine can reduce the hormone (especially if enough copper is taken). "In order to create autoimmune thyroiditis in laboratory animals, anti-thyroid drugs and/or goitrogens must be administered along with iodine. The main problem is that insufficient dietary iodine allows these goitrogens to block iodine activity, and subsequently thyroid hormone which cannot be made without sufficient iodine. When there is sufficient iodine in the body, it can produce iodinated lipids, which help protect against an autoimmune thyroid disorder. The problem today is that iodine consumption is so low, combined with our exposure to numerous toxic halides, that iodine may not be in adequate supply to produce iodinated lipids. In fact, it can require up to 100 times the RDA of iodine to produce these lipids. Some individuals with fibromyalgia require dosages of up to 100mg per day for benefits. When there is an inadequate supply of iodine (iodide) for the thyroid gland, at the same time iodine binding sites are blocked (by competitive inhibition of iodine) by toxic halides (goitrogens), this is believed to activate the thyroid peroxydase (TPO) system through elevated TSH (Thyroid Stimulating Hormone). In turn, insufficient levels of iodinated lipids, combined with insufficient levels of magnesium can result in excess production of hydrogen peroxide. Essentially the level of hydrogen peroxide is well above normal due to lack of a feedback system. When working properly, this feedback system acts as a "brake" to shut off excess hydrogen peroxide and keep it from causing damage to thyroid peroxydase (TPO) and thyroglobulin. The damage to TPO and thyroglobulin elicits an autoimmune reaction via the production of antibodies, creating damage to thyroid cells and resulting in potential Hashimoto's or Grave's disease." Is this (thyroid boost) sold anywhere else? Perhaps something that can substitute it? I only have paypal.